Announcing the winners of the 48th ever Right Place Photo Caption Contest! Presenting the top 25 captions for this picture from Kevin Lamarque/Reuters via Yahoo! -- "What you Democrats do to your own world is of no concern to the rest of the galaxy, but if you carry your high taxes, your social engineering and your wild-eyed Senators to other planets, you will face annihilation! Come, Gort." -- To thank his son for finishing Saddam, George, Sr. gave W one of his 1,000 points of light. -- Also Sprach Karl Rove. -- See, I TOLD you I was always the Rising Son! -- "By the power of Greyskull..."
-- Imperial Margarine makes a comeback with President Bush on the label. -- In an attempt to win the gay vote, President Bush dons a tiara and belts out showtunes on Oprah. -- The lights are on, but 'guest workers' are moving into your home. "I'm from Texas, dammit. We don't say that word." -- "Dang, I guess those Iranians were further along in their nucular program than we thought..."
-- Everyone talked about doing it, but only George Bush succeeded... IN SPLITTING ATOMS WITH HIS MIND! -- Nothing like the death of a despicable, loathsome terrorist to brighten up your day. #10: "I slew Hillary with my sword, and now I'm the Patron Saint of England? How does that work?" #9: The President poses for a new image intended to replace the pyramid on the back of the one-dollar bill. #8: Instead of just going for highlights, George decided to add actual "sun" to his hair. #7: And that’s when Dubya got an idea; an awful idea. A terrible, wonderful, awful idea! #6: For Democrats, the "light at the end of the tunnel" revealed a terrifying sight. 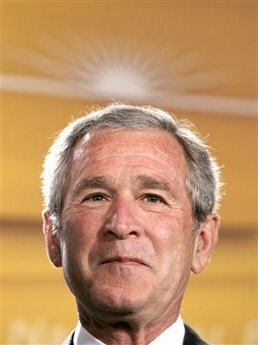 #5: George Bush did the trick where he uses his brainwaves to create light, but all the Democrats at the party complained that it leaned to the right. #4: With the Democrats always complaining about the separation of Church and State, Bush decided to finally push them over the edge into outright lunacy. #3: "No, Jeb, I ain't gonna turn around. We both know there's not a four-hundred foot tidal wave of Country Time Lemonade bearing down on me." #2: It finally "dawns" on Mr. Bush what true conservativism means.